Buy and sell your LAND in the Metaverse! Today we are very excited to announce our Marketplace. 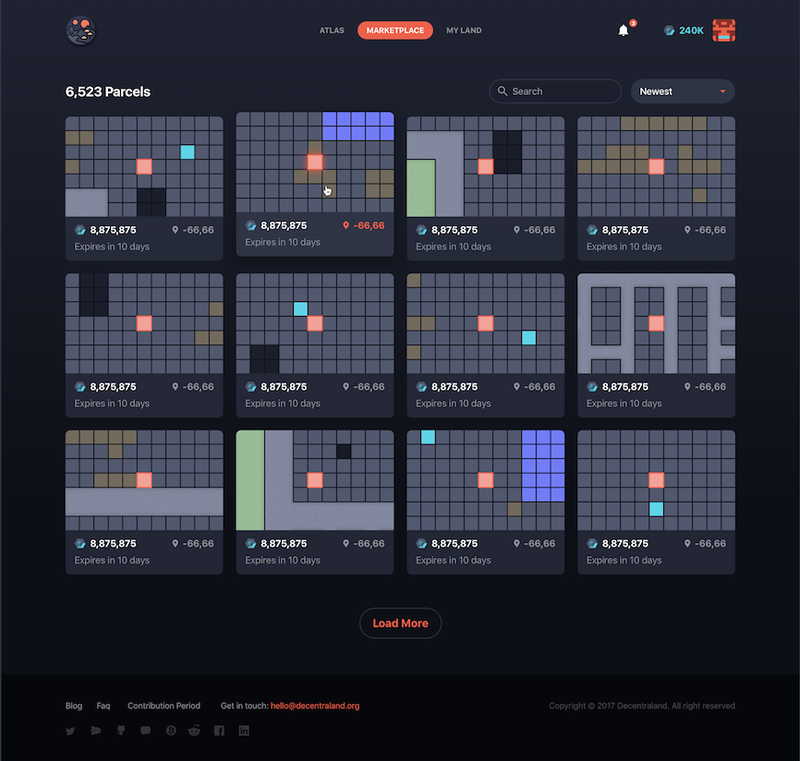 After the Terraform Event it became evident that we needed to provide an easy way to control your assets within Decentraland. After a few weeks’ work, we are are delighted to deliver this tool to our users. This is the first release in what will be a series of tools designed to help you manage your assets within the Metaverse, trade with other people, and ultimately become the king of your own content. I’d like to give you a brief overview of the different functionality offered in the Marketplace, and how you can use it to start trading and managing LAND. Now, what can I do with the Marketplace? Publish a parcel of LAND for sale, setting your own price in MANA and an expiration date for the offer. Buy a parcel that is for sale. Name your parcel and give it a description. Transfer your LAND to a different user. Control the parcels you own and visualize the contributions you’ve made to districts. Explore the world through a map to see who owns what. How do you secure my assets? The Marketplace app is backed by a smart contract that provides a trustless and transparent exchange for buying and selling LAND. The Marketplace is completely open source, and you can view the contract code in our GitHub Repo. We’ve also designed the Marketplace to facilitate atomic swaps. In cryptocurrency exchanges, an atomic swap is a transaction that requires each party to fulfill their obligation (either delivering MANA or a LAND token) before a specified amount of time elapses. The transaction is made final if, and only if, each party holds up their end of the deal before the time is up — all of this is executed by an Ethereum smart contract. These atomic swaps completely remove any counterparty risk. To get started with the Marketplace, simply visit market.decentraland.org, read through our Terms & Conditions, and start browsing LAND in the Atlas! When you are ready to begin trading, or if you want to view your LAND holdings, you’ll have to log in and unlock your wallet. The Marketplace supports MetaMask, Mist, or Ledger hardware wallets. Please make sure that you’re using the same wallet address you used during the LAND auction if you already have purchased LAND, otherwise those parcels won’t show up in your account. Since location and proximity to roads, districts, and plazas play such a large role in determining the value of LAND, we wanted to make sure that you can get a broad, visual overview of Genesis City — so we’ve added the Atlas View. 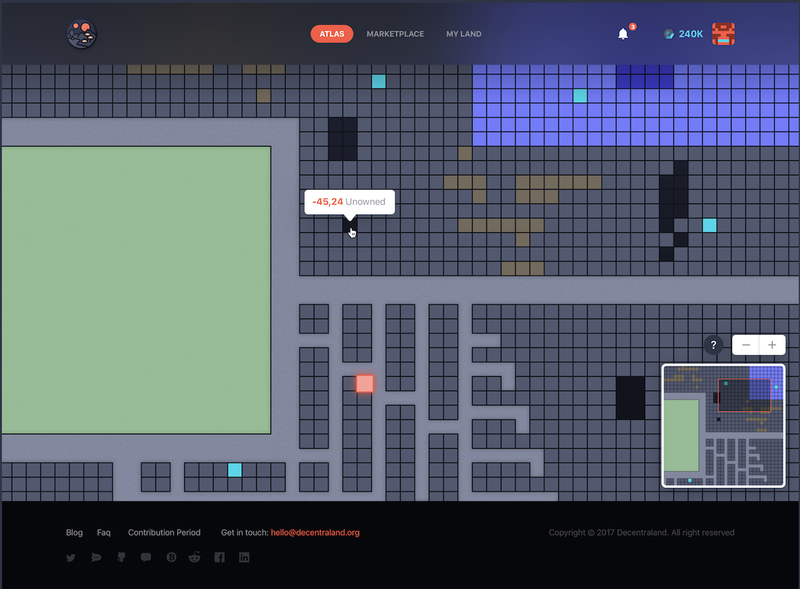 The Atlas view gives you a bird’s-eye perspective of every color coded parcel, road, district, and plaza in Decentraland. You can click and drag the map to move around, zoom in and out, or hover your cursor over a parcel to see its x,y location and owner. You can always click “Color Key” in the footer for a rundown of what each color means. Any parcel that is currently for sale in the Marketplace will be highlighted. If you’d rather see a list of every parcel currently offered on the market, you can use the Marketplace View. You can sort offers by “Newest”, “Cheapest”, “Most expensive”, and “Closest to expire”. To learn more about a particular parcel that’s for sale, simply click the tile in the Marketplace. We created this section so that you can manage all of the LAND parcels you own. To view this page, click My Land. Here you’ll find a list of all of your parcels, including any that you’ve contributed to community districts and any parcels that you have listed for sale. By clicking on one of the parcels listed under My Land, you can edit its name, description, put it up for sale, or transfer it directly to another wallet address. Before buying or selling LAND you first have to authorize the Marketplace to perform secure exchanges for your account from the settings page. Once you have authorized the Marketplace to operate MANA and LAND on your behalf, you’re ready to start trading! Aside from the small gas fee required by the miners for every transaction conducted on the Ethereum network, Decentraland does not collect any surplus trading fees. If you have another account that you want to move your LAND to, or if you want to send LAND to a friend without charging them any MANA, you can make a direct transfer to any other wallet address simply by clicking Transfer from that parcel’s page. We’ve worked to ensure that the Marketplace is simple and easy to use, but if you ever have questions or feedback, please reach out to us using the in-app Intercom widget. For a more in-depth orientation to the Marketplace, checkout our video tutorial here! As with all of our other tools, the Marketplace is open-source software, and you can find the code here. Feel free to create an issue, or submit a pull-request! We hope you like the first version of our Marketplace like we do. We have many features in mind coming after this version, stay tuned! See you all in the Metaverse.